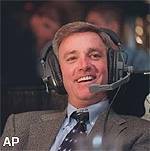 Clemson Tiger Sports Properties announced today that the Tommy Bowden Coaches Call-in Shows – “Tiger Calls” – will be hosted live on location by Mike Hudson (’84) of Roper Ford in Seneca and by Herb Tyler (’82) of the all-new Chick-fil-A of Seneca. “Tiger Calls” is a one-hour fan interactive program featuring Head Coach Tommy Bowden and the Voice of the Tigers, Jim Phillips. The broadcast time for “Tiger Calls” is 7:00 – 8:00 p.m.
Clemson vs. Georgia Game Ball Giveaway Fans attending the August 28th show will have the opportunity to register and win a game ball used in the Clemson vs. Georgia football game signed by the 2003 Clemson football coaching staff. Clemson Football Day at the Game Fans attending the August 28th (Georgia game), September 4th (Furman game), September 11th (Middle Tennessee game), October 9th (Virginia game), October 23rd (North Carolina game), November 6th (Florida State game) and November 13th (Duke game) shows will have the opportunity to register and win a Clemson Football Day at the Game. The Day at the Game package will include, 2 tickets to the next home game in a suite at Death Valley (including food and beverage during the game), the opportunity to watch the taping of the Tommy Bowden Television Show, 1 Tommy Bowden autographed football, 2 Clemson football hats and 2 Clemson football t-shirts. Tommy Bowden Autographed Football Fans attending the September 18th, September 25th, October 2nd, October 13th, October 30th and November 20th shows will have the opportunity to register and win a Tommy Bowden autographed football. Roper Ford in Seneca and Chick-fil-A of Seneca will also serve as the host location for all 17 remaining “Tiger Calls” scheduled to start immediately following the Clemson football season.